In December 2015 the future steps for successfully combating climate change will be determined at the 21st COP to the UNFCCC and the 11th Meeting of the Parties to the Kyoto Protocol in Paris, France. As Member States negotiate a global agreement for future concerted efforts, SIDS are already experiencing the often drastic impacts of climate change such as rises in temperature and sea level. 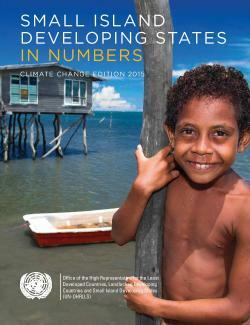 SIDS In Numbers – Climate Change Edition 2015 provides, at a glance, a snapshot of select key SIDS indicators under the three dimensions of sustainable development: Environment, Social and Economic, to highlight the impacts of climate change on SIDS. The presentation of the data and statistics contained in this publication should not be taken as authoritative. They are being presented in a manner that attempts to illustrate and advocate for the special case of SIDS in the context of climate change. Data was obtained from a variety of sources, including the IPCC’s AR5 on Climate Change published in 2013, The World Bank’s Report “Turn Down The Heat”, recent publications by various UN agencies including UNEP, UNISDR, UNDESA and from the broader scientific community. The data used in this publication is exclusively obtained from publicly available sources. While extensive literature on climate change and related issues exist on a global scale, SIDS regions and individual countries in general remain under-researched. As a consequence, specific data on climate change impacts in SIDS is often sparsely available.